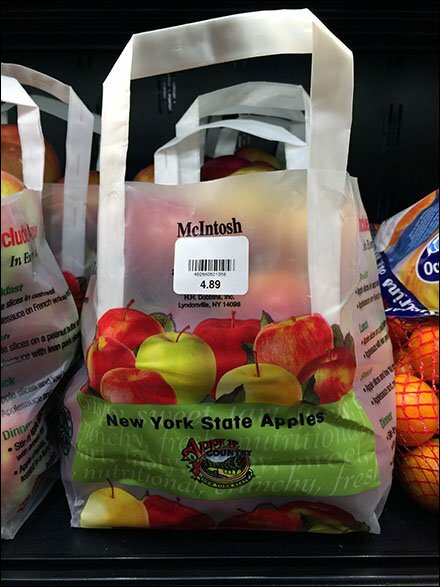 The fresh appearance and immediacy of bulk produce sales is preserved by the open-top appeal of these Fall Grab-and-Go New York State Branded Apples. Reinforced carries are a separate element and add a crafted feel to what otherwise might appear to be a mass-manufactured plastic bag. Colorful printing also aids self-merchandising too, but note that having the New York State Brand as a footer makes it hard to see along the shadowed bbag bottom. 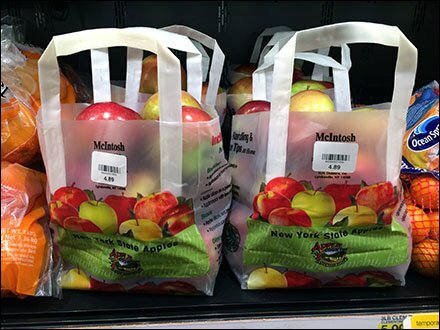 Still a damn nice bag, that ads value to the Fall Grab-and-Go New York State Branded Apples sell, just grab one and go.